People are often surprised to find out that I do not enjoy shopping for fabric, given my love for all things interior design related. I am fully aware of the beauty that a lovely fabric adds to a room, and think that the selection of the right fabrics with the right patterns, textures, and/or colors are essential elements in the design of a room. However, to me, shopping for fabric is like shopping for clothes - there are so many options, so many styles, my heart sinks every time I walk into a fabric showroom. I am definitely more of a fan of furniture. I could look at furniture all day long. Sometimes I go to the Atlanta Design Center or Americas Mart for the sheer joy of looking at the most exquisite furniture you can imagine, all different styles and shapes and colors. To me, a well made piece of furniture is like a sculpture - so much care and consideration must be put into the scale and proportion in order for the furniture to 'work'. Then there is the matter of the finish, which can give a piece of furniture an entirely different look if it is created in a light or dark finish, a painted finish or stain. 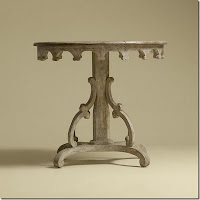 The Nantucket table by Rose Tarlow-Melrose House is, without a doubt, my one of my favorite pieces of furniture. I love the curves of the legs and finials counterbalanced with the straight beam in the midde, and the decorative elements carved into the top. After reading 'The Private House' by Rose Tarlow recently, I have an even greater appreciation for this beautiful piece of furniture. Quotes from Tarlow perfectly describes her approach towards the furniture in her line: "I don't reproduce furniture, I simply adapt designs until I find them pleasing". I highly recommend this charming book; it is a book that is mainly text, in some ways more of an autobiography. I loved reading Tarlow's observations on a life well led; she is keenly observant and has a sincere appreciation for quality over quantity, for slowly collecting, and for giving a room an emotional layer that goes a bit beyond just decorating. 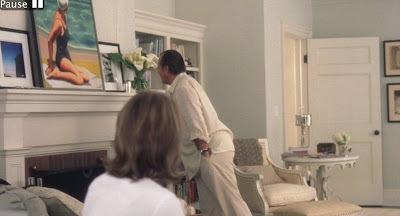 The Nantucket table has gained a fair amount of press because of its placement on the set of 'Something's Gotta Give' - it was used in the main character's bedroom. One of my all time favorite designers, Lars Bolander, used the Nantucket table in my favorite home from his portfolio. On rare occasions, I spot this table in my favorite design magazines. When I first saw this picture (image via Southern Accents, photo credit Tria Giovan), I noticed nothing but the Nantucket table. Now I am also appreciating some of the other details in the room - the contrast of the light finish of the table with the darkness of the built in cabinets. As a side note, I have recently noticed quite a few cabinets that are actually built into the wall - they look like furniture, but a recess in the wall has been created. Rose Tarlow is represented by Ainsworth-Noah in Atlanta (to the trade). I must admit that I purposely seek out this table every time I go into the showroom. Earlier this year, the showroom displayed the table next to a bed. Recently, it was paired with a sofa in a living room scene. Same lamp, though! If I were to buy this table, I am not sure where I would put it. And, I wonder whether my dog Ben would knock this table over with his huge enthusiastic tail? He has decimated an antique table that belonged to my husband's grandmother as it has been knocked over so many times. This table, however, looks quite sturdy with its base with four legs. I keep thinking about Rose Tarlow's own recommendation in 'The Private House'- she is emphatic about buying what you love, and you will find a place for it. Does this philosophy work for you? Please visit Rose Tarlow's newly relaunched web site for more inspiration. Also, for an excellent write up of the new location of Rose Tarlow's showroom in Los Angeles, see Velvet & Linen's post. To purchase Rose Tarlow's wonderful book, The Private House, click here. I love that table and her furniture line. I look forward to carefully reading this book. I do believe in the philosophy of buying quality over quantity in pretty much every area and acquiring special pieces that you will have forever. Oh, yes, I adore that table, it has such a unique look, I hate to even ask, it must be very costly though! Love the table! Rose's book is one of my favorites and I read it cover to cover a few years ago. You have inspired me to take it off the shelf and take another look at it.She is most insightful. I have read several posts lately on "buy what you love" and fully agree with this philosophy. If one doesn't, then how can he or she really love their home and surroundings? I know sometimes we need to buy for practical reasons, but even then I try to find something I really love.For example, I am looking for bedside tables and am determined not to just settle - I am holding out for function and LOVE! If you have admired this table for so long, you need it! You will find the perfect place for it, and then find another perfect spot in your new house! I think the table is TTI-puppy-proof. For all it's curvy beauty it looks solid and sturdy. It's feet are firmly on the ground. Fabric is great, fabric stores are great, enjoying fabric stores as little museums is great. But fabric shopping is best left to professionals. Too expensive to get wrong. It is a beautiful table! I can see why you love it ~ it has so much going for it and can work anywhere. This is a beautiful table and I love her furniture line. I also agree in buying quality over quantity. I, too, love this gem of a table. And I only buy what I love and it does always fit. Ikea has made a humble nod to this fabulous table but I do not see it in the catalogue now...I, also, am never pleased to buy the copy...I ALWAYS wish I would have waited and bought the REAL DEAL. That table is gorgeous -- and I think it looks sturdy enough to handle a large dog (and maybe even children!). I also suspect the piece will just get better with age...a few nicks and scratches would only enhance its charm. Stunning! I have never heard of the Nantucket table before (must have been sleeping under a rock). But I sure will remember it now - and everytime I see it! I love the lines and the patina. It almost has a gothic look. Very beautiful. OX, Monika. I love accent tables that could go in any room. I think they are the best investment pieces because of their versatility. This is a truly stunning piece. Beautiful table. I would love to have it! What a beautiful table! The pics are great too. maybe after saladino's first book and stephandis's book on his country house - this is my favorite! oh and I adored The Winter House too. And Bunny's first book. ok. I'm a design book whore. I am a great fan of Rose Tarlow's design. This table is wonderful and could work anywhere, xv. Like you I am also a furniture shopper! That Nantucket table here I could fall in love with ! WONDERFUL!!!! Adore her furniture line as well. And you have done a fabulous job creating a very comprehensive list of where it's appeared! Can fit into many settings. Hmmmm....where there is a will there is ALWAYS a way. Holly, get the table! I love that table, too. Wow - love the table, too. It's the kind that would fit in with so many different decors even though at first glance it doesn't give that impression. It's style is so unique but classic - doesn't hit ya over the head with its presence. I love that table, too! It looks stunning no matter where it's used. I am constantly trying to find a little space for one, but so far no go, so I must admire from afar. I love your blog! Well now I have a new distinction, with this table. Thanks for the great post! I love curvy furniture, I can see why you love it! P.S. I really enjoyed the Rose Tarlow book. That is a wonderful table. Like many of your readers, I am a big fan of Rose Tarlow's furniture. But I was terribly disappointed when I visited a Fifth Avenue apartment she had decorated. It was a design mess! Despite the lovely pieces of furniture, she just couldn't pull it together despite the almost palatial architecture. But she has a great eye for finding interesting pieces and reproducing them.